Today we launched the ELTjam Academy – an online training platform designed to help ELT professionals develop their careers in an industry being transformed by digital technology. The ELTjam blog was born at IATEFL 2013, and therefore this week celebrates its fourth birthday. For those four years, we’ve tried to do two very specific things: to lift the lid on things happening outside of the world of ELT that might be having an impact on us; and to give a platform to people who are trying to do something new and innovative in our industry, be it creating new products, using new technology, working in new ways, spreading new ideas and research, or championing new causes. For us, it’s always been about sharing and responding to new and exciting opportunities. Over those four years we’ve managed to speak to hundreds if not thousands of ELT professionals around the world and hear about the things they want to improve, the opportunities they see, and the things that they need help with. It’s clear to us that the industry is changing, and that therefore the skills and knowledge required to flourish in ELT are changing too. This is where the ELTjam Academy comes in. The main goal of the ELTjam Academy is to empower the ELT profession in the digital age. Whether you’re a teacher, school manager, publisher, product developer, freelancer or author, you’ll find courses to future-proof your career or business in a rapidly changing industry. 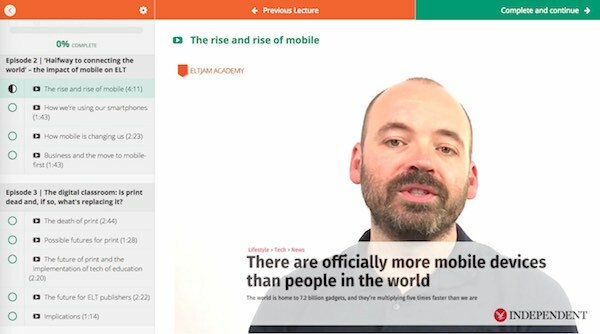 The ELTjam Academy won’t just feature courses from us. We’re inviting anyone with an interest in future-focused professional development in ELT to contact us about creating courses for the Academy. And we’re delighted to announce Jeremy Day, Cambridge English Language Assessment and EC English as launch partners. Expect courses from all of them to appear in the coming months. It will encourage us, as a profession, to be learner centred in our approach. We believe this is the most direct route to delivering the maximum amount of value to learners, which is our primary responsibility. It will help you as an ELT professional to build a rewarding, long-term career. It will be as affordable as we can make it, so that it can reach as many people as possible. Related to point 3, we are delighted to be offering our first course – ELT in the Digital Age – for free until the end of April. All you need to do is use the discount code IATEFL17 when checking out. Or, even easier, go to eltjam.com/free and a 100% discount will be applied automatically. In this course you’ll learn how the profession of English Language Teaching is being shaped by the digital age and how to future-proof your career within it. It’s presented by me (Nick Robinson), and features content from Scott Thornbury and Professor Rose Luckin of the UCL Knowledge Lab. The Academy will help you shape your future in ELT. We hope to see you there.